Its About Time building international solidarity, with Tanzania. The brick donor wall has been completed and I am happy to attach a picture of your brick. You will always be a part of this library and will also be remembered for your generosity and interest in this project. 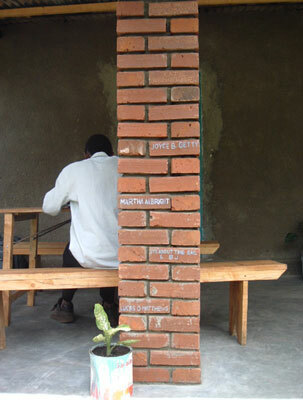 The committee decided that the appropriate way to honor all of the generous donors was to construct a brick "pillar" which actually supports the building. It is a visual reminder to everyone who visits the library that the people who donated the money for our renovation actually made the library possible. We are proud of our accomplishment in this project and hope that you know you were an important part of its success. These bricks may seem to be merely symbolic, but the truth is that the donor wall is a physical feature of the library and everyone who comes to visit stops and reads the names. People here are not only fascinated by the concept of the "buy a brick" fundraiser, but are genuinely touched at the level of support that comes from our friends and family abroad. On behalf of the library committee and the Jifundishe board, I want to thank you for your help and support.